Learn about the people and history of LISC Chicago and its national parent organization. LISC Chicago's mission is to connect neighborhoods to the resources they need to become stronger and healthier. The Board of Advisors provides guidance and counsel to LISC Chicago. The Board’s purview includes policy development and strategic planning; budget and finance; credit review and supervision; and fundraising. 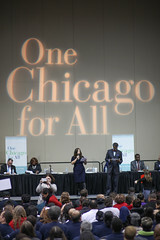 Board members are selected on the basis of their engagement in community development matters in the metro Chicago area. LISC Chicago employs a staff of experienced professionals, all well versed in the business of community development. Find their contact info here. LISC Chicago is part of a nationwide non-profit corporation, the Local Initiatives Support Corporation, headquartered in New York. LISC operates in more than 30 cities and a like number of rural communities throughout the United States. Founded in 1979 by the Ford Foundation, LISC helps both community-based and for-profit development organizations transform distressed neighborhoods into healthy ones – where people choose to live, do business, work and raise families.